The human tells me that today is the last day of 2014. I hope it has been a good year for you. I have enjoyed sharing stories with you throughout the year. Some of them were happy, and some were sad. 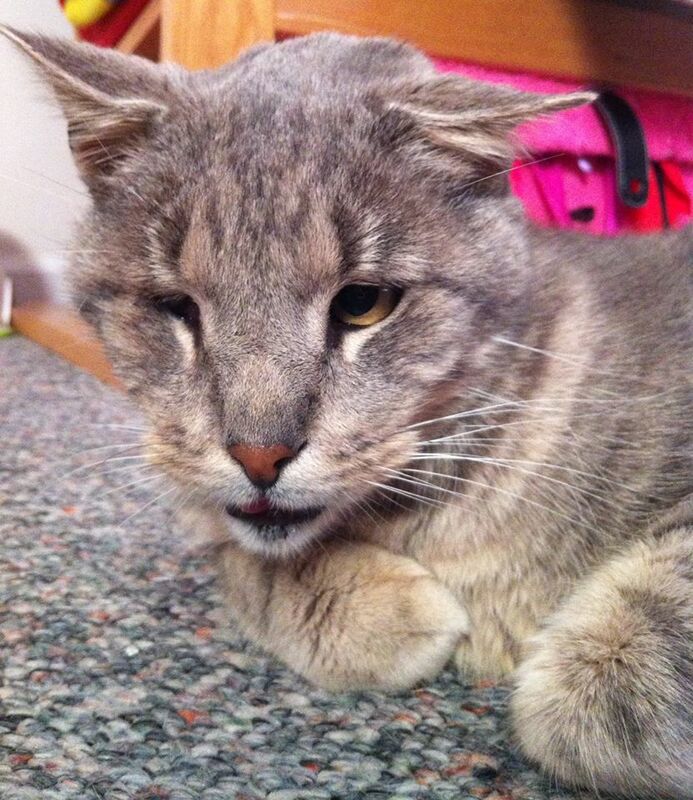 Today, since it is a day for celebration for most of you humans, I will share a very happy story of a special needs cat. It is not easy being a diabetic cat, but I do not have anywhere near the challenges that Zeb has. He’s an older guy who has FIV, but that’s just one of his challenges. He also is missing an eye, and he only has four teeth. My furiends, that is truly a special needs cat! 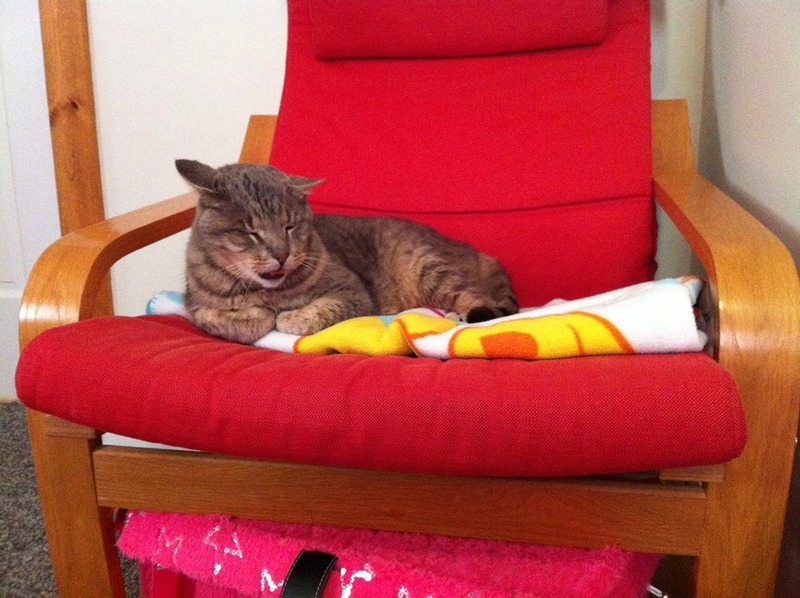 Now this special needs cat has gone from the streets to a loving home, which he shares with two humans, two small humans, another FIV positive cat, and a canine. And the humans there love having Zeb in their home. The small humans in the house “absolutely adore him,” his adopter said, adding that getting pictures of Zeb is very difficult because he comes running over to give her head bonks and purrs when she gets on the floor to use her camera. Zeb has started a Facebook page where he shares his gratitude with lots of adoring and happy fans. He is very happy to have come from being a cat living on the streets to being rescued and having a furever home. Getting that home is the best way for a feline to end the year, and I am very happy for Zeb! It is very sad when a two legged or four legged creature does not have a home. Too many humans, felines, and canines are living on the streets. What is even more sad is that for many humans, when they get help, they must leave their pets behind. Many do not want their pets to be homeless animals without any help so they do not accept assistance. 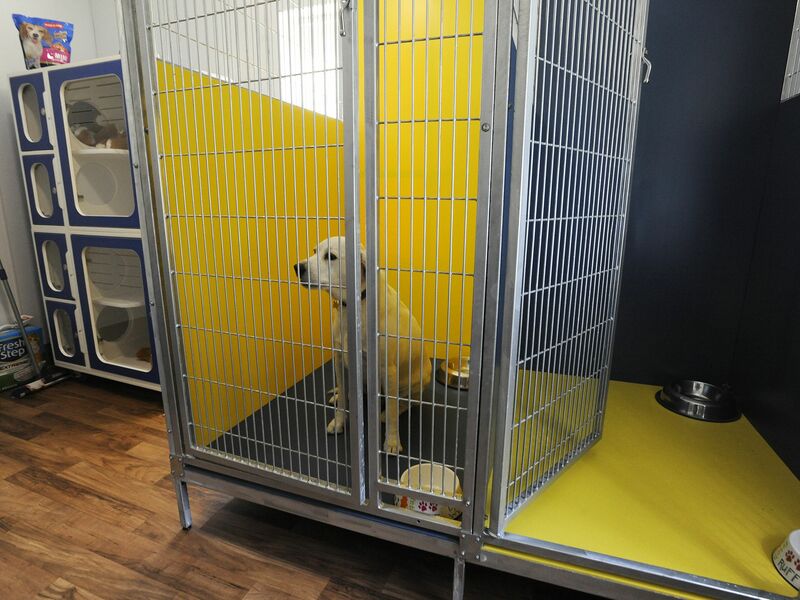 Thanks to a grant from PetSmart Promise, that is not the case for humans helped by Family Promise in Montgomery, Alabama. Four canines and four felines will be able to live there while their humans get the help they need to transition into a life off the streets. Sadly, after going through so much together as homeless animals and homeless humans, these animals typically must be surrendered. Around half of the humans getting help have had to relinquish their animals to animal rescue groups in the area. “It’s very traumatic, and lots of tears are experienced when they have to give up those animals,” said one of the humans at Family Promise. In order to make room for the formerly homeless animals, one of the humans working at Family Promise has given up her office. This is part of an upgrade to the facilities. Because the homeless anmals were were typically kind canines and felines, they were adopted out very quickly after they were surrendered. Then the homeless humans, after getting the help they needed, were not able to bring their four legged furiends back into their lives. Now, for some homeless humans and homeless animals, that bond will not have to be broken. The humans can get the help they need to get on their feet, and their loving four legged companions will be there with them. This is a very good idea and I hope that it spreads! Many of you humans say that we felines cannot get along with our fellow four legged creatures, canines. And it is true that sometimes we fight with them. It is because our body language is so different. When a canine is wagging its tail, it is happy. When a feline does this, it means the opposite. This can lead to misunderstandings. But sometimes, despite this, felines and canines become best furiends. And that is what has happened with Borys the bengal cat and Walter the greyhound. They are best buddies. Borys was already living with his humans when they decided that they were going to rescue Walter. Walter came to them through the Southern Alberta Greyhound Association, who rescued him from a race track in Idaho. 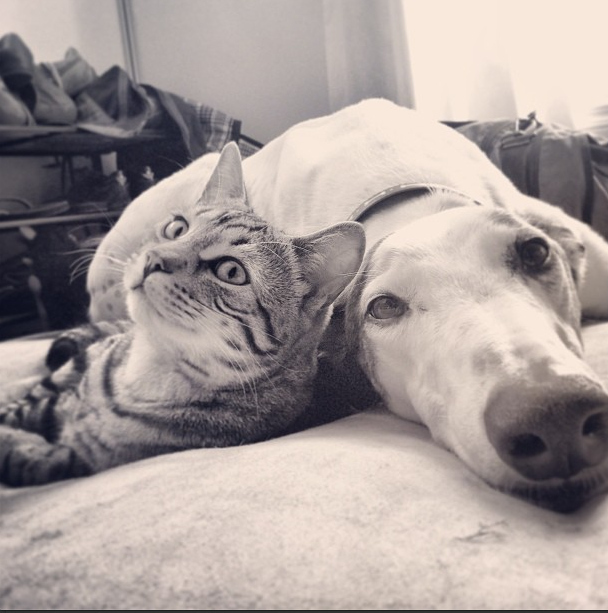 There are some humans who say that greyhounds cannot live in a home with cats, because their chasing instinct and prey drive is too strong. That is not always true. Besides, I do not care how fast a canine is. In a home environment, we cats have the upper hand because we can climb to places they cannot get. Especially bengal cats like me, Jacey, Marley, and Borys. And this was not a problem for Borys and Walter. Despite being rescued from a race track, Walter did not chase Borys around. Instead, he found the presence of my fellow bengal cat to be very comforting. The two are now best furiends. They like to snuggle together, nom together, and when it is time for Walter to get a bath, Borys will keep him company. Maybe it is good that Borys is a bengal cat because we are a breed that does not mind water. It is always fun for me to share stories of animal friendships that make humans smile. 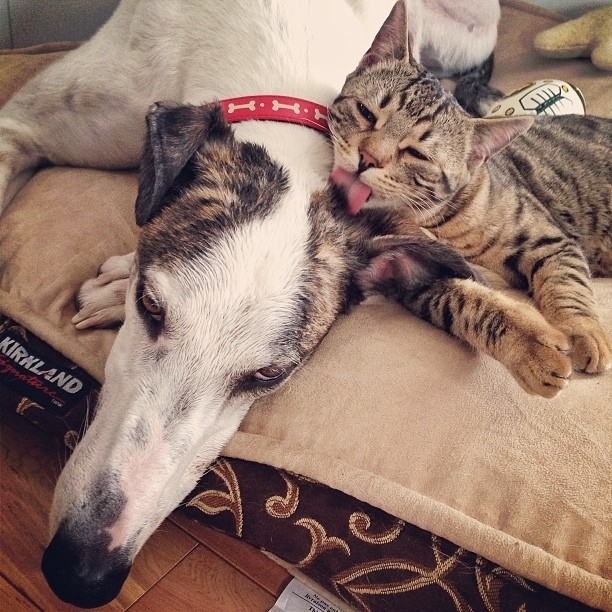 Borys the bengal cat and Walter the greyhound definitely have one.